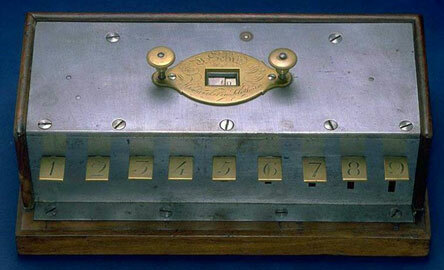 The calculating machine of the swiss clockmaker Victor (or Viktor) Schilt (1822-1880) was exhibited in 1851 at the Great exposition of the works of industry of all nations in Crystal Palace, London, and received an honorable mention and a bronze medal, placed after the calculating machines of Staffel and Thomas. The machine of Victor Schilt was a single column adder, almost an exact copy of the first calculating machine of Jean-Baptiste Schwilgué and there is an obvious reason for this—Schilt worked some two years in the workshop of Schwilgué in Strasbourg (around 1847-1848), before to return to his hometown (Grenchen, canton of Solothurn, Switzerland), where he later built many tower clocks. In the workshop of Schwilgué in Strasbourg Schilt was mainly busy working on tower clocks, but undoubtedly he was engaged also in the making of calculating machines, because in the same 1848 he made the first copy of his machine. 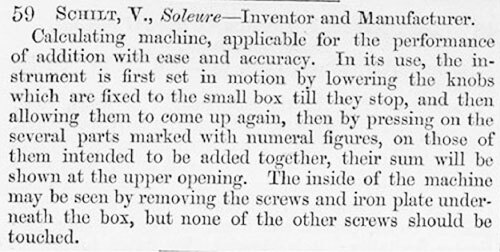 At the 1851 London Exhibition Schilt reportedly received an order for manufacturing of 100 machines, but refused to produce them, probably because he wasn't the inventor. Now a copy of the Schilt's machine, a solid and well manufactured device, featuring an inscription V. Schilt, Mechaniker in Solothurn, is in the collection of Smithsonian Institution in Washington (see the photos below). It is a wood and metal device with measurements: 11.9 cm x 26 cm x 14.5 cm. The front, top and mechanism of the machine are steel, while the case is wooden. 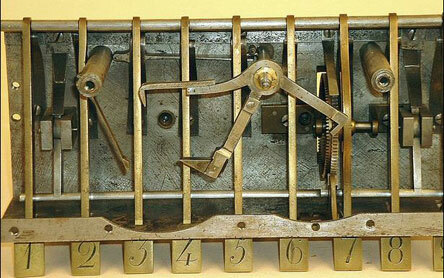 The plate and zeroing knobs on the top and the nine digit keys across the front are made of brass. The machine adds numbers up to 299. Only one-digit numbers can be entered. The result is visible in a window on the plate.